Well now that summer is here, Sangria is heating up all over town! Head to you local Sip n Saves, Thirsty Camels and independently owned bottle shops to get your hands on some of the good stuff! Enjoy the “half red, half white” mix….’Sangria the pink’ which is our personal favourite! And with our hot new cocktail list to match this summer you will never get bored of the classic Sangria session. Heading to the Barossa? Want to win a huge Christmas hamper!? Make sure to call into the Vine Inn. They have a selection of our award winning red wines, our new Semillon Chardonnay white blend, our new sparkling wine Royaltea range – Blueberry Rose and Peach Chardonnay, and of course our Sangria. Buy any product to dine in or take away and go in the competition to win. The Lighthouse Wharf Hotel is doing big things in the port. Not only does the place look fantastic with the new owners – Heidi and Mark sprucing the place up, they are also featuring our wines, Royalteas and Sangria cocktails this summer. Head on down and enjoy the great drinks, gorgeous views of the harbour and the grand heritage surroundings. Also, don’t forget to support your local surf clubs this summer! They are keeping all us water lovers safe down on the sand! 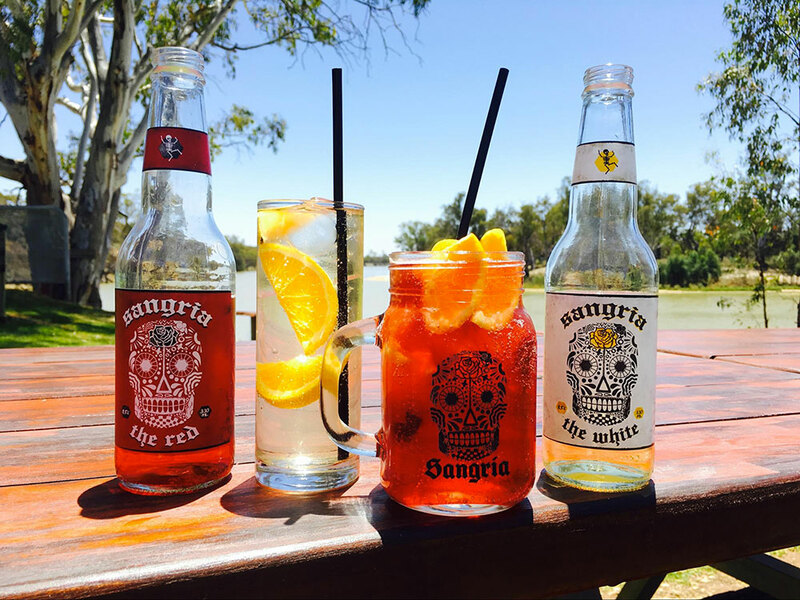 Henley Beach Surf Life Saving Club are on board with our Sangria cocktail jugs too!…..and probably have the best beach view in town. Christmas is only two weeks away! Where did that year go? We will be closed Christmas Eve and Christmas Day but don’t let that stop you from getting your Caudo Sangria fix over the silly season. We have plenty of quick present ideas, stocking fillers and the sweet, jolly nectar that be Sangria. Whether you have been good or bad this year, I’m sure there is room under the Christmas tree for the adults. The Cellar Door will open for Boxing Day bringing you live entertainment with local artist Trick. This would be the perfect opportunity to take your family and friends out for a day by the river relaxing, especially after a big Christmas Day. Save cooking and entertaining.. Let us do that for you. The Cellar Door closes for New Year Eve but we bring in the New Year with a great day to celebrate. “The Machines” band will be entertaining you and to fill your tummy.. Pete’s amazing woodfired pizzas. Just what we think you will need after a big new year night also. Local duo band, “Acoustique’ will keep you entertained from noon onward this Saturday (8/12) coming with some relaxing acoustic music. It is their first appearance at Caudo Vineyard so we are pretty excited to introduce them to the Cellar Door vibe and view. This Friday the 11th, the Cellar Door is staying open late for an afternoon serving up our popular gourmet wood fired pizzas for dinner. We invite you to stay a while, lounge by the river with a cold Hogwash Bend Lager and soak up the beautiful colours in the sky as the sun sets. Please call to book a table. Introducing the “Prickly Nut” cocktail made with Caudo’s White Sangria. This creamy and delicious cocktail blends the best tropical flavours together and suggests an island getaway. Simple to make and enjoyed with friends. Pick up some White Sangria from your local independent Bottle Shop or Caudo Vineyard Cellar Door to give this a try. Finally! A little relief from this heat spell. This weekend will bring a much anticipated cool change. Friday will be partly cloudy with a slight chance of showers in the morning and some light winds also. Saturday is looking beautiful and sunny with a gorgeous top temperature of 27. Sunday will heat things up again, bringing the Mercury back up to the mid-thirties and mostly sunny conditions through to Monday. Join the town for Christmas celebrations and a firework spectacular with rides for the kids, a vintage car procession and a huge pageant display through the Main Street of Barmera. Entertainment throughout the night and great food available. The award winning pageant will start at 6pm from the Morgan CFS heading down to the Terminus and Commercial Hotels. Firework display and live music by ‘The Pigeons’ with food stalls and free goodie bags for kids under 12. Plenty to see and do for the family. At the Lions Riverfront from 9am. Check out the large range of goods and second hand items. Pick up a bargain. All welcome at the Rotunda, East Tce, Loxton. Hosted by the Christian Churches of Loxton. BYO chair and your singing voices. A “Little Town” production telling the story of Christmas in a unique way. St Peter’s Lutheran Church in Loxton. Tickets available online www.littletown.com.au or at Loxton Ministry Centre. $5 adult $2 Child.